As we are getting closer to the official release, the Nexus 6P has started leaking even more. Now we have a complete slide show presentation about the bigger Nexus. 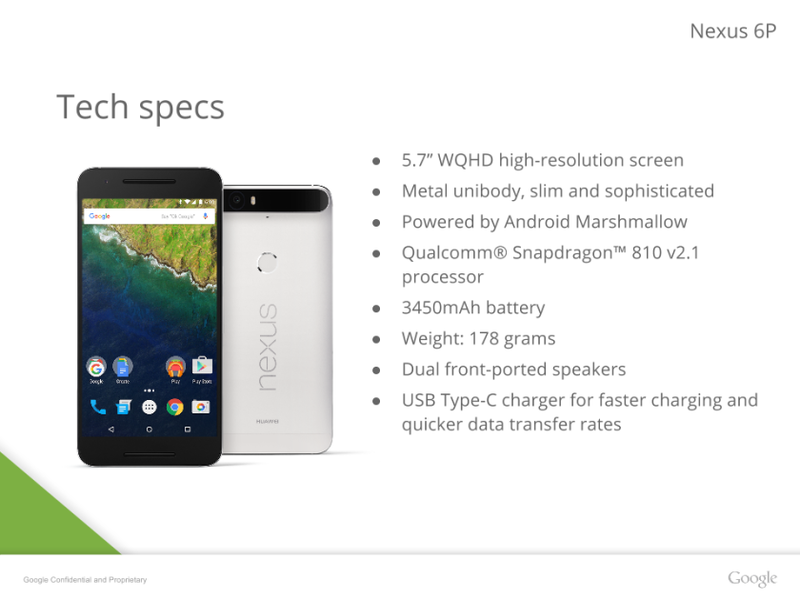 The full presentation, linked below, reveals almost everything we want to know about the upcoming Nexus 6P. Previously rumored 5.7″ QHD display and a Snapdragon 810 are confirmed and the impressive battery capacity, 3450mAh, is also leaked. USB Type-C and dual front facing speakers are also included as well as the storage and color options. The storage capacity options are 32, 64 and 128GB and the colors are the same that were leaked previously, white, aluminium, gold and black. We were still missing some features but the rest of the presentation was uploaded to Google Drive. An AMOLED display, 3GB of RAM and 12/8MP cameras were leaked. Also the physical size of the device was included in the slides. The 6P measures at 159.4 x 77.8 x 7.3mm, slightly narrower and thinner than the Nexus 6 but the same in height. All we are now missing is the price. The Nexus 5X will be the more affordable one but Google should have learned from last year, the Nexus 6 was just too expensive for some. The Nexus event is supposed to happen tomorrow and we will keep you posted.